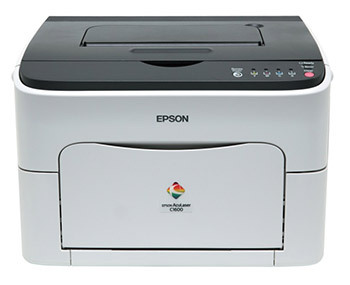 Epson AcuLaser C1600 is a new affordable and economical the printer with fast printing speed. Epson is planning to strengthen its position in the market of laser technology by introducing a new compact A4 color printer, the Epson AcuLaser C1600. Fast and reliable, Epson AcuLaser C1600 provides high print quality and usability. Thanks to an affordable price, cost and compact size, this model is ideal for home office and small organizations. Epson AcuLaser C1600 is a reliable office assistant, featuring a fast first page out (13 seconds in black and white), high speed printing (up to 19 ppm in monochrome and 5 ppm in color) and an increased monthly volume printing (up to 35,000 pages). Excellent print quality is achieved due to the high resolution of 1200 x 600 dpi and an innovative Epson AcuBrite toner. The efficiency is backed-up by high-capacity ink cartridges and low power consumption. Built-in high speed USB 2.0 and Epson Remote Panel software provide convenient connection, setup, and printer management. Thanks to the front access to inputting paper and replacing toner cartridges, as well as the multi-purpose tray 200-sheet for variety of media, Epson AcuLaser C1600 is very easy to operate and maintain. This entry was posted on Tuesday, November 9th, 2010 at 11:42 am	and is filed under Epson, laser, printer. "Urbee: First Car Printed With 3D-Printer"